Matthias (Matt) Hilger grew up in Pfaffenweiler, Germany and came to Jasper, Indiana in April of 1987 through Sister Cities International as a young journeyman in cabinet making to gain language and professional work experience in his trade. With his education as a cabinet maker, he began his work at the Indiana Desk Company and was hosted by Claude and Martina Eckert. In 1989 he married Kathy Young of Jasper and they continue to reside in Dubois County. As a German citizen he has been involved in the Jasper German Club and Sister Cities of Jasper since his arrival, helping to organize many activities as well as chairing them. He has been on the Board of Directors for both organizations for many years. Matt has been influential in starting the Jasper Partnership Commission and has presided over it since its inception in 1997. With the help and influence of others, he has maintained the annual German American Day celebrations as well as the annual German Heritage Award which began in 1999. Due to Matt's direct link to Jasper's Sister City, Pfaffenweiler, he is the son of Franz and Bärbel Hilger of Pfaffenweiler, took on the responsibility as the active link, communicator, translator, organizer, etc. between the two towns, assuring a strong relationship, not just for the short term, but into the far future. ​In 2012 Matt Hilger received the Germany Friendship Award during the opening of the Jasper Strassenfest. The Award reads: To Matthias Hilger "in recognition of your endeavors in fostering and sustaining friendship between the Federal Republic of Germany and the United States of America." The Award is signed by the German Ambassador. It is the highest honor the Ambassador can bestow upon an individual. Mayor Terry Seitz acknowledged that the city of Jasper worked many years with Matt to strengthen Jasper's German heritage and especially the connection with its Sister City Pfaffenweiler. 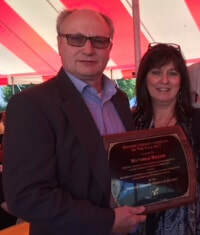 Matt's 2017 Hoosier-German American Award reads: To Matthias Hilger - For his lifelong commitment and leadership in Jasper's German-American community and for his tireless efforts to strengthen Jasper's connection with its sister city Pfaffenweiler.